Note to media: Above information not for public broadcast; Text okay. ​SAN DIEGO (May 11, 2017) – Finding an affordable place to live seems out of reach for many in San Diego, but a new high-rise is making affordable rent a reality for hundreds of San Diegans in need – including people who have experienced homelessness. 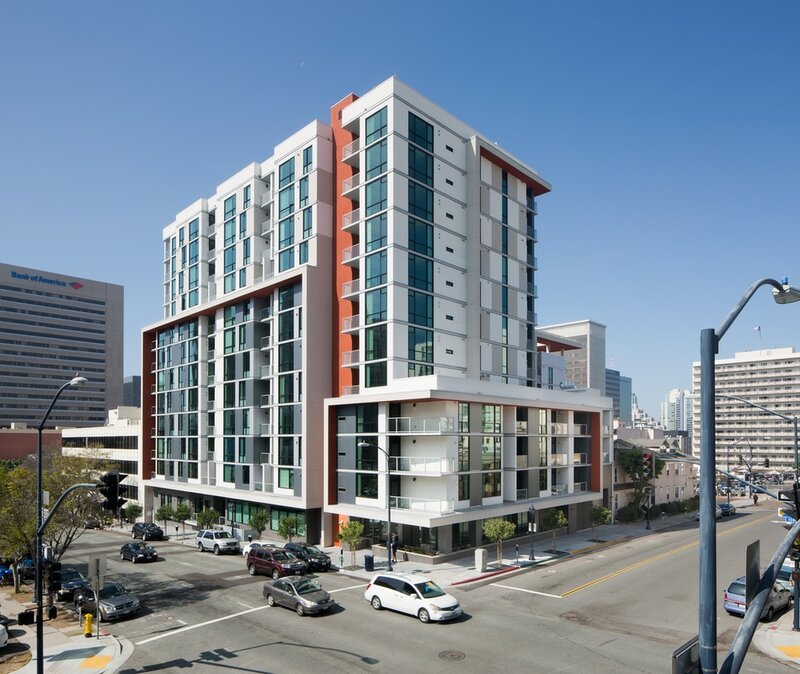 On May 31, Wakeland Housing and Development Corporation will hold the grand opening ceremony for Atmosphere, a community of 205 affordable homes in the heart of downtown San Diego with monthly rents that range from roughly $525 to $1,250. While 154 of those affordable homes are designed for qualifying individuals and families earning around $17,000 to $48,000 per year, 51 are permanent supportive housing apartments designed specifically for people who have recently been homeless - including individuals with mental disabilities. These safe, secure homes include wrap-around resident services that promote stability and allow them to thrive. Atmosphere is Wakeland’s largest development to date as well as the most unique, according to Wakeland’s President and CEO Ken Sauder. According to the 2017 San Diego Homeless Point-in-Time Count, there are currently 9,116 people experiencing homelessness in San Diego County, up 5 percent from last year. In the downtown neighborhood near Atmosphere, those numbers are rising even faster, with an increase of 27 percent since last year. The need for permanent supportive housing is vital in San Diego County, as it gives people a permanent place to live so they can become stabilized, allowing them to access community resources with the goal of staying housed for the long term. This combination of housing and services – also known as the Housing First model – is a solution that has helped some communities in the United States reduce chronic homelessness on their streets by as much as 90 percent. Also, unlike a temporary shelter or homeless services center, people cannot walk in and receive services at a development that provides permanent supportive housing, as the services are only available to residents. Wakeland’s Atmosphere development demonstrates their ongoing commitment to the San Diego region, providing affordable homes and permanent supportive housing options to help alleviate the homeless crisis in our county. The $79.3 million Atmosphere development was completed on time and on budget. Financing drew on a unique mix of sources including both 9% and 4% state tax credits, state infill funding, vouchers from the San Diego Housing Commission and former redevelopment funds from Civic San Diego, which has worked for many years with Wakeland to bring the Atmosphere community to life. "We are excited that Wakeland entrusted this important affordable housing development to us as their financing partner. Atmosphere will provide an excellent, safe home that will change residents' lives for the better so that they can achieve their "possible,'" said Vihar Sheth, senior vice president of U.S. Bancorp Community Development Corporation, a division of U.S. Bank. Designed by the internationally-recognized firm of Joseph Wong Design Associates and built by Suffolk Construction Company, Atmosphere will achieve a LEED Silver Certification for sustainability. The community features 12 stories of modern, comfortable and functional homes around an open central courtyard with three levels of underground parking, community rooms and a rooftop deck. Atmosphere was also built to ensure longevity. With 205 units, it could potentially provide affordable homes to more than 10,000 San Diegans over its expected 55-year life span as residents succeed and move out, making room for other neighbors in need. Atmosphere is fully leased-up, but people who think they may qualify for affordable housing can go to www.wakelandhdc.com to find information about the waitlist as well as a list of other properties that they can call to inquire about vacancies. The grand opening ceremony will take place at 11:30 a.m. on Wednesday, May 31 at Atmosphere, 1453 Fourth Ave., San Diego, 92101. A media preview and tour of the building will start at 10 a.m., with check-ins beginning at 9:30 a.m.